This post is the start of a new feature on Accessory Generation called "In The Closet With...." where I plan to feature private accessories collections of some of the most stylish and fashionable notable New Yorkers who regularly grace the pages of fashion and lifestyle magazines. I hope my readers will enjoy the private tours of their closets! Dubbed the "New Queen of Wall Street" by Fortune Magazine, Alexandra Lebenthal is the CEO of Lebenthal & Co, a third generation investment firm by day and one of New York Society's most well dressed women at night. Every time I have ever seen Alexandra at the many charity events we both attend she is always wearing the most beautiful and interesting accessories to complement her lovely and colorful designer gowns. Earlier this year, at the Museum of the City of New York winter ball, I admired the stunning vintage Kenneth Jay Lane earrings Alex was wearing and asked if I could photograph them for this blog. That led to a very gracious invitation to visit her apartment and photograph her entire collection of vintage costume jewelry. For me that's more exciting than an invitation to the White House! Not only do I love jewelry, but I also love looking in people's closets (by invitation only of course), because people express their personalities through their wardrobe choices. I also happen to be obsessed with organizing and I love to see how others arrange their closets. I'm happy to report that Alex has special drawers to organize and protect her collection. Alexandra's collection, including the earrings pictured above, was started with pieces that her mother bought as a young woman in the 1960's and later passed on to Alex. Both Alex and her mom before her, shared a love for large earrings and much of Alexandra's collection is comprised of sparkly, ornate, dangling showstopper earrings that can elevate a nice outfit into a knockout look. My afternoon in Alex's closet was amazing. 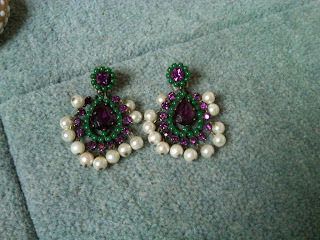 Her collection of vintage costume jewelry includes some of the finest pieces I have ever seen. What I love about her collection is that it sports a variety of styles, colors and designers and there are smaller collections by specific iconic designers that comprise the bulk of the overall collection. I took almost fifty photos while I was there and I've edited that down to about thirty to post. We pulled items out by designer and I researched and have shared below a little background on the major ones for those readers who are interested in learning about the history of vintage jewelry as well as just appreciating its beauty. Alex's favorite costume jewelry designer is Larry Vrba. Vrba got his start designing for the legendary Miriam Haskell (see below). For the past thirty years Vrba has been designing his own contemporary Lawrence Vrba collection comprised of large, colorful, theatrical pieces. 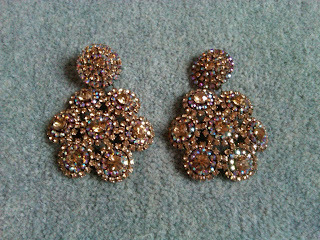 After seeing Alex's collection I am now a Vrba fan myself and have purchased a pair of his earrings at a vintage shop. Alexandra has a variety of vintage Kenneth Jay Lane pieces as well, including earrings, pins, bracelets and even a rare belt. Internationally renowned Kenneth Jay Lane may be best known nowadays for his phenomenally successful mass sales on QVC, but KJL started out as a shoe designer who made jewelry in his spare time and eventually developed that hobby into a business. His costume jewelry has been worn by celebrities and first ladies alike and his vintage pieces are highly collectible. Some of my favorite pieces are part of Alexandra's vintage Chanel collection. Coco Chanel started designing costume jewelry during the Art Deco period to complement what was then the very modern women's wear that she introduced to the world. In the 1930's Chanel employed the now famous Verdura as the head designer of her costume jewelry department . Coco Chanel favored green and red stones in her creations and she exclusively used Maison Gripoix in Paris as her supplier because of their poured glass stones that have a translucent quality. In reference to costume jewelry Coco Chanel once remarked "Costume jewelry is not made to give women an aura of wealth, but to make them beautiful." Her pieces certainly do that and they remain amongst the most sought after jewelry with collectors and fashionistas alike. A closer look at the breathtaking medallion. 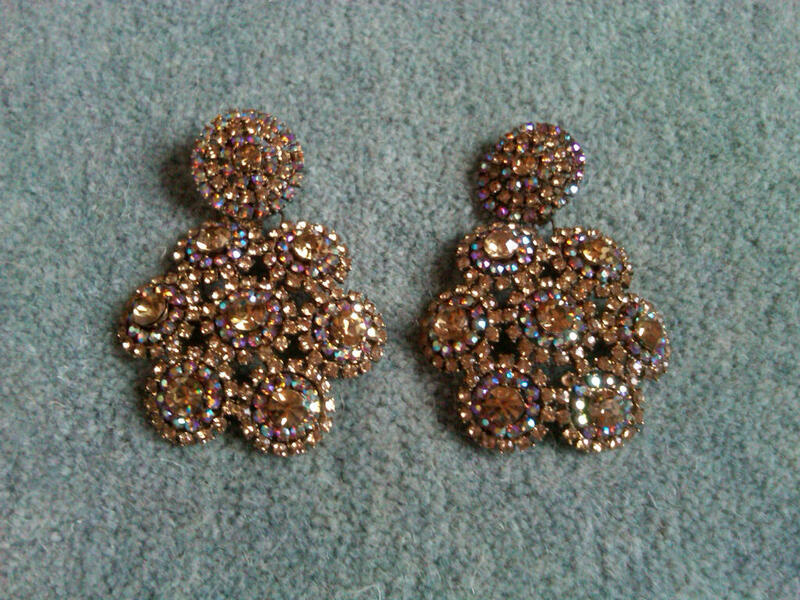 Alex's penchant for earrings is evident in her colorful Thelma Deutsch collection. Deutsch was known for bright colorful brooches and elaborate earrings. Many of her pieces were made from vintage molds from other well known costume jewelry designers which she would re-work and make her own by changing key elements, like the color of the stones. No vintage costume jewelry collection would be complete without at least one piece from the legendary Miriam Haskell. Haskell started out in the 1920's and was a trailblazer in the early days of costume jewelry and was one of very few woman, along with Coco Chanel, who were in the business. In fact, Haskell also sold Chanel's jewelry in one of her own boutiques. Haskell was very popular in Hollywood with movie stars and performers. Joan Crawford was rumored to have had a set of almost all of Haskell's pieces made from the 1920's to the 1960's, and the one and only Zeigfeld outfitted his Follies with Haskell designs. In addition to the mini collections of important vintage designers above, Alexandra has individual pieces from very well known and collectible costume jewelers as part of her overall collection. She also has some unsigned pieces that are interesting and stylish, too. Alex had these earring made from links of a broken Trifari bracelet. Beautiful, and an ingenious solution to saving a vintage piece!